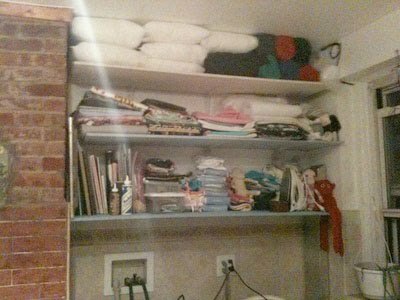 So I have finally finished the construction in my kitchen corner/studio to give myself a storage space for all my supplies, because looking for things when they are in a heap spanning a desk 2 chairs and a table akin to the garbage heap on Fraggle Rock is not productive. It feel so much better to be able to see everything I have to work with instead of constantly searching for stuff. 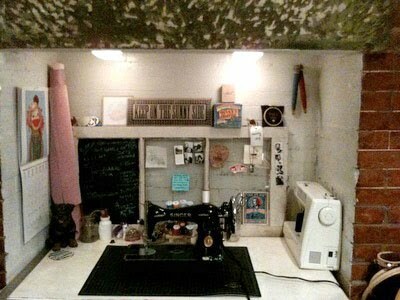 Hopefully I can confine my sewing to my "sewing desk" and give Dan back the kitchen table. I also installed a couple tap lights above my desk for extra lighting. The shelves I covered in fabric before I hung them so that there is no splintering on my supplies, because I used really cheap ply wood. P.S. WILL SOMEONE PLEASE BUY ME A NICE CAMERA!!!!! 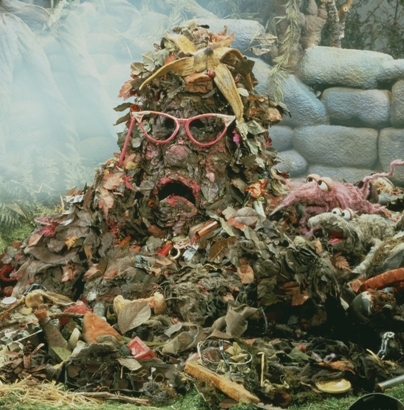 Hahah I love the pile from Fraggle Rock!